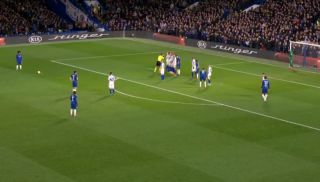 Chelsea star Willian has given the Blues a 2-0 lead against Dynamo Kiev in the Europa League this evening with an absolute beauty of a free-kick. The Brazilian has had his fair share of stick from CFC supporters for much of this season, but he showed what he’s all about here with this wonder-goal. One imagines Chelsea are now safely heading through to the next stage of this competition, barring a total implosion tonight or in the second leg.